Which products are the most discreet incontinence pads? Which Incontinence Pads are the most Discreet Option? There are a large number of reasons why many people with incontinence will avoid buying products for their condition. One of the most common reasons is the worry that pants and pads will become visibly obvious to other people. Although wearing the correct product can make incontinence easier and manageable, the embarrassment of wearing the products can simply prevent people from getting the necessary help. However, incontinence products do not have to be a nuisance or prevent you from wearing your favourite outfit. If you suffer from light to moderate incontinence, there are many pads that are discreetly designed and allow you to enjoy daily life without the worry of products becoming noticeable. What are the most discreet incontinence pads? Smaller, discreet incontinence pads are designed specifically for individuals looking for subtle, light pads. When looking for discreet incontinence pads, you need to look for pads designed with an ultra-thin absorbent material. Discreet pads have a low ISO absorbency rating, which makes them thin and light. Shaped pads are the best option for individuals with light incontinence who are looking for a subtle and light pad. Manufacturers design both men’s shaped pads specially designed to fit the male anatomy and women’s pads specially designed for the female body. Popular ranges of body shaped pads include the TENA Men and the TENA Lady Pads. Anatomically shaped pads are ergonomically designed to fit closer to your body than inserts, enabling greater protection against leakage. 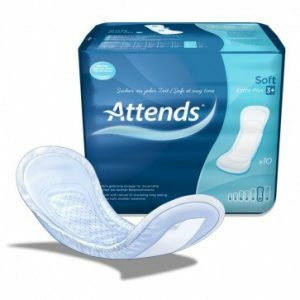 These shaped pads range in absorbency levels and are designed to be the most subtle and discreet. Discreet pads are soft and kind to the skin, giving you the necessary protection where you need it with a discreet look. TENA Lady Discreet Normal is the same size as a menstrual towel but is designed for light to medium bladder weakness. MicroPROTEX™ compressing technology in the pads provides you with absorbency where it matters the most, making sure you have the security you need and the discretion you want. Tena Lady Discreet pads are specially designed to fit the female body shape, providing a close and extra discreet fit for women. You can buy Tena Lady Discreet pads on our website here. The new soft micro incontinence pad range is significantly smaller than traditional incontinence products. Attends Soft are easier to fit and apply, more discreet for the user, and much drier and more comfortable. Soft 6 and 7 offer the most innovative as the pads are 56% smaller than traditional incontinence products. The pads can be worn with the user’s own underwear rather stretch pants. The pads are available from absorption degree 0 to 7 and are thin and fully white for extra discretion. Our Attends Soft range can be found on our website here. 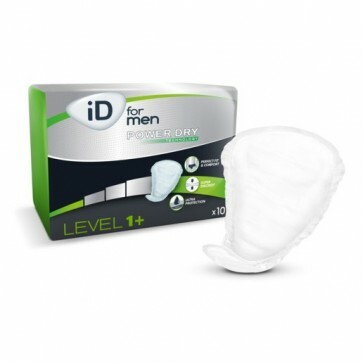 iD for Men is an individually wrapped pad ideal for managing light to moderate urinary incontinence in men. The male-specific design enhances comfort and security. The elastic gathers ensure a secure fit and the adhesive strip secures the guard inside the user’s own underwear. Comfortable, fit and light, iD for Men will feel light during use and will not affect the user’s daily life. Shop iD for Men here if you feel the pads are the most suitable choice for you. Top quality shaped pads provide the user with an effective and reliable pad that they can wear with real confidence. 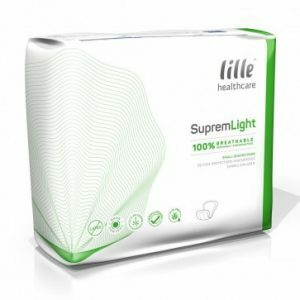 Anatomically shaped for maximum user comfort, Lille Supreme Light Shaped Pads are suitable for use by both men and women, with their slim, compact design and self-adhesive strips, allowing them to be worn securely but very discretely under a user’s own pants. At Incontinence Supermarket, we have created a section specifically for products that provide discretion and are designed with an ultra-thin absorbency. You can visit our full range of discreet pads here. Looking for a discreet product that is ideal for long journeys? You can read our blog on travelling with incontinence here.